Three coastal cities in Pakistan’s Sindh province, including the country’s financial capital Karachi, would be submerged by 2060 if the current trends of sea erosion in the Indus delta and coastlines continue unchecked. That was the unambiguous message delivered by National Institute of Oceanography (NIO) chief Dr Asif Inam to parliamentarians last month. While Badin and Thatta would drown by 2050, Karachi, a sprawling city of over 20 million people, would go under by 2060, Inam said at the briefing to the Senate committee on science and technology. Experts attribute this doomsday scenario to changes in weather patterns and temperatures as well as unplanned development in coastal areas. “Three cities of Sindh, Karachi, Badin and Thatta, are under direct threat due to sea levels rising. This needs timely mitigation measures,” Inam told thethirdpole.net. Like all other deltas in the world, sea intrusion is a reality in the Indus delta, too, he said, suggesting that latest images be obtained with help from the Pakistan’s Space and Upper Atmosphere Research Commission to assess the threat and take corrective steps accordingly. Many coastal areas in Badin and Thatta had already been submerged due to rising sea level, he added. However, he avoided sharing the exact scientific data for the basis of his claim. In his briefing to the Senate panel, he also said that a significant part of Karachi’s Malir area had already been affected by seawater and the city would not be safe unless steps were taken to rectify the situation. The NIO chief also warned that coastal cities in Balochistan province, including the port city of Gwadar, where China is planning to operate an international sea port, would face a tsunami threat due to rising sea levels. An official from the Balochistan government also told the Senate committee that more than two kilometres of coastal land had been submerged due to sea water intrusion in the last 35 years. 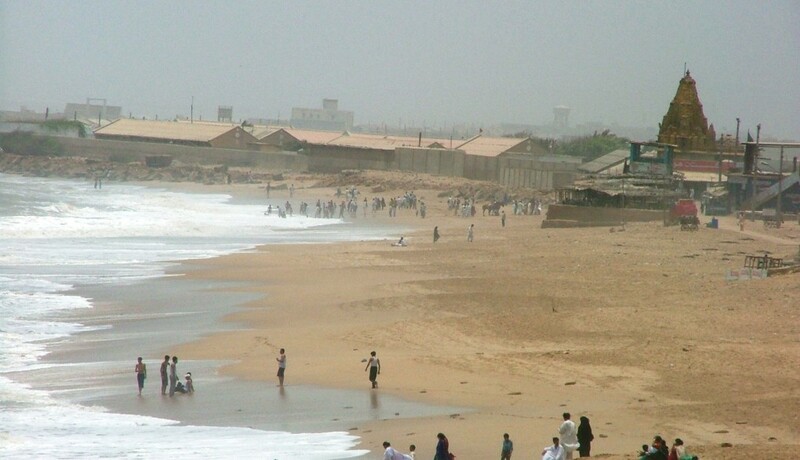 According to the national assessment report on coastal erosion in Pakistan, prepared by IUCN, the climate change ministry, United Nations Emergency Force (UNEF) the mismanagement of development work was causing coastal erosion along the Balochistan and Sindh coasts, making them vulnerable to storm surges and Arabian Sea cyclones. ”It is believed that if the present trend of sea level rise along the Pakistan coast continues for the next 50 years, the sea level will rise 50mm(5cm) from the present level. If such sea levels rise is experienced in the next fifty years due to a very small gradient in the Indus Delta, seawater will frequently inundate the upland areas causing massive erosion,” the report says. Large amounts of sediment is brought down from the Himalayas by the Indus River and deposited along the lower stretches to form one of the biggest deltas in the world. But damming of the Indus River has drastically reduced sediment loads and river flow downstream. “The Indus delta now has been reduced due to upstream engineering works. Damming of the water upstream has reduced river discharge and owing to ingress of high energy waves, erosion activities are amplified manifold resulting in seawater inundation during storm surges or cyclones activities in the area,” the report states. The report also noted that erosion has forced some local communities to migrate from the area. The study also points to the unique geography of the Pakistan coast that makes it vulnerable to natural hazards, such as earthquakes and climate related factors like heavy rainfall upstream of the Indus River flooding the delta, sea level rise and changes in monsoon pattern. Given the alarming situation, the Senate committee has suggested that the matter be taken up at the Council of Common Interests (CCI) — a powerful federal forum represented by the chief ministers of all the four provinces to take major decisions – to discuss immediate mitigation and precautionary measures. The Senate body also suggested that the Planning Commission, the country’s top policymaking body, include various projects in the coastal areas in the Vision 2025 programme to tackle the situation. A worried Sarfraz Hussain Solangi, professor at Sindh University’s Department of Earth Sciences, said sea levels were rising due to global warming and climate change and this was threatening Pakistan’s coastal areas, including Balochistan and Sindh. “We have to prepare for climate change as the temperature of Karachi will rise by three degrees and the northern areas will witness five degrees increase in temperature,” he said. Agreeing with the NIO chief about the submergence of Karachi, Badin and Thatta, he said upstream damming of the Indus had drastically reduced sediment loads downstream. This led to sea intrusion, in turn prompting the erosion of deltas islands and creek beds. Local NGO Pakistan Fisherfolk Forum chief Syed Muhammad Ali Shah termed the NIO chief’s revelations a wakeup call and said nearly 3.5 million acres of agricultural land in Sindh had been eroded since 1956. Calling for immediate measures to protect the Indus delta, Shah said the construction of dams and barrages upstream and the stoppage of water flow in the delta were responsible for the crisis. He cited studies to say that the sea intrusion had inundated more than 2.2 million acres of farm land in Thatta and Badin districts. Mangrove forests were being steadily depleted, leaving the region vulnerable to greater damage from storm flooding. Forests, agriculture lands and the entire eco system of the Indus delta were being damaged. “Thousands of people who were surviving on water of the Indus delta have migrated from area,” he added. Taking a slightly different view of the situation, Taj Haider, a senator of the province’s ruling Pakistan Peoples Party (PPP) and environmental activist, said Thata and Badin were under the threat of sea erosion but not Karachi. The city, he said, does not fall under Indus delta system. Disclosing that 2.4 million acres of land had come under sea erosion in Thatta city alone, he said, “The PPP provincial government is constructing a 225 kilometre wall to safeguard Thatta and Badin to protect them from sea erosion.” A further mitigation measure of his government would be the construction of a 220 kilometre, four-lane road along the coastline.